Currently, beading has become a real art, and the creation of many masters with this craft can be called true masterpieces. In fact, to learn weaving bead is not too difficult, as it may seem at first sight, but in order to learn his techniques, and even more, Do they close, you must possess such qualities, patience and perseverance. And if you do them at least a little own, and you also have a great desire to learn how to create real beauty, you can safely proceed to get acquainted with this art. Even more so that the final outcome, if you learn weaving from beads, you will never be disappointed and may even want to make this activity a hobby. ThroughTable. 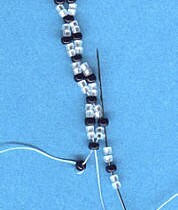 The simplest technique, consisting in stringing beads on a string. needle technique. With this method of weaving just fine obtained genital parts, such, eg, like a needle spruce, pointed petals, as well as the fringe and tassels for cushions, curtains, earrings or belts. Parallel weaving beads. This technique is used for the creation of pendants, Tsvetkov, volume figures and animals. The process of weaving usually first recorded by special formulas. looped weave. 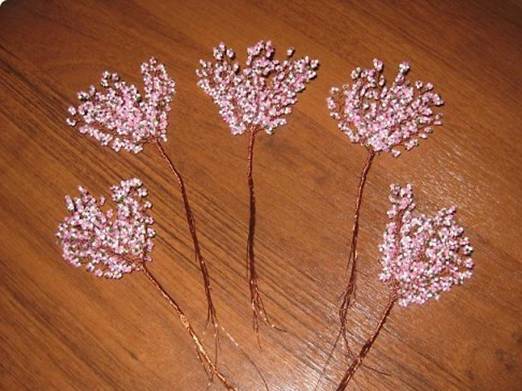 This method is done in the form of loops and is indispensable for weaving petals, twigs and leaves. French braiding with beadsm or circular machines. It used to weaving flowers and leaves on the wire. This technique is considered to be one of the most difficult. Dense weaving machinery: Ndebele or herringbone, hobelenovoe, Lacing tile or brick weave beads, brick stitch. Such techniques are widely used for the manufacture of earrings, belts, Tie and cuffs. mesh netting for braiding vessels, covers or collars. volumetric weave. It used to weave necklace, plaits, volume figures, beads. To start learning is preferable to choose the simplest model and weaving method, so just do not overdo it and finally get lost in the process. work-out, you can gradually complicate their task, and master more complex models. In the beginning, instead of line, used for weaving of beads, You can use a strong thread, eg, caproic. The thread should not take longer than plaiting, than half a meter. Too long a thread is not very comfortable to use, if there is no particular skill and experience, as it can become entangled or scuff when passing through the bugle. When selecting the size of the beads should pay attention to its number, an example of which denote, looks, eg, in the following way: 7/0. This designation indicates the total number of beads in equal chain 2, 54 cm (inch). It is believed, The more beads have a numbered, the smaller the bead itself. But a comparison can be made only with respect to the product of the same manufacturer. One of the best quality is recognized by many Japanese beads, but its price is also quite a tall. For the price of the most affordable product is chinese beads, but the quality is considerably inferior to many manufacturers, one of its drawbacks, eg, is the roughness and the presence of irregularities on beads. 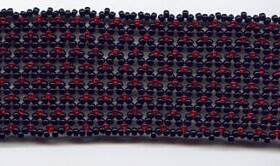 The most used is the Czech beads, made of glass. The price and quality of its most optimal. 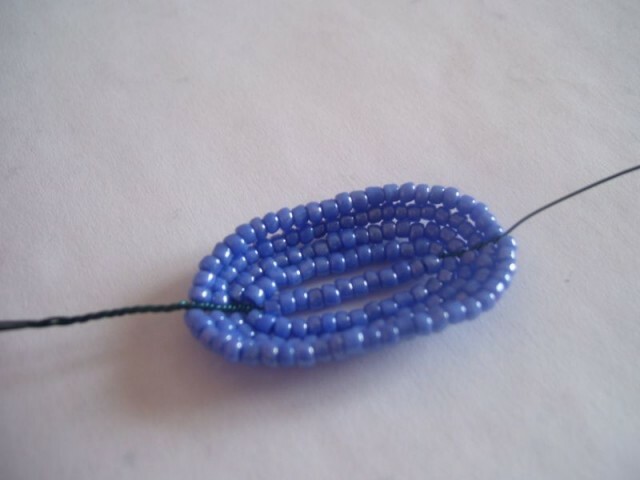 Before embarking on Bead Weaving, you need to wax thread, and periodically do it during the entire process. This is done, to future product well keep its shape. Waxing is done as follows:: piece small size wax softens first bit, To do this, it can be put, eg, to cover the heated kettle, then this piece of the entire length of the thread you need to spend a couple of times. Excess wax on the thread are removed using a needle, in this way: thread passed through the needle eye, appropriate size, and removed all unnecessary. If the end of the thread exfoliate and threading beads to your work out was hard, and in this case it is possible and necessary to use wax to seal them and rub the tip. 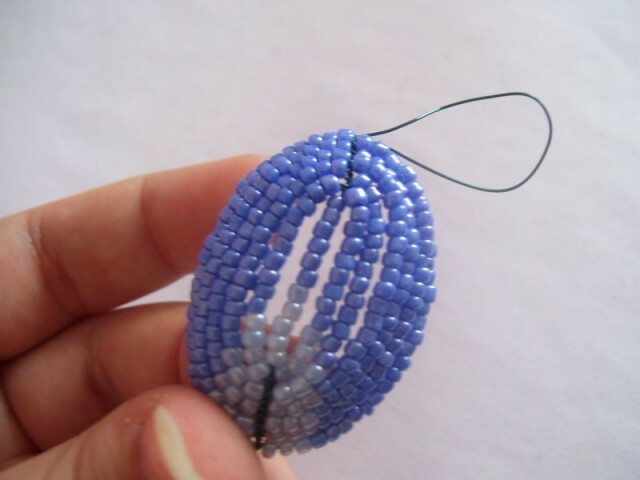 On thread beads worn simultaneously with a needle, you want to keep in the right hand, and then doctored forefinger. Large beads are strung up on the needle. In that case, when it became clear, that the size of the selected thread or wire is not enough for all of braiding, it is better to stop the operation immediately and start a new build-up. Do not leave too short ends from the previous and the new thread, because, in consequence, it would be difficult to hide and secure (left ends of the thread, as late as, and at the beginning of, should not be less than 10 cm). Capacity thread or fishing line to start a little earlier from the place, which ended the previous, it will need to repeat the previous part of a small piece of the picture, while trying to re-threading does not pass a needle and thread through the previous thread, a place next to her. Upon completion at the beginning of the work on a thread, before you pass it through the beads, PVA glue can be applied, for better fixation and strength of the product. 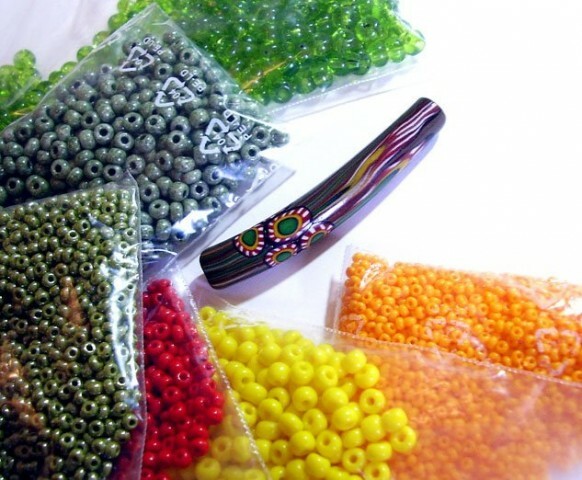 Only for beginners Bead Weaving, it is better to do with the large beads. Incorporation yarn is as follows: thread passed through the needle through a pair of beads drawing, then around the warp yarn products made fixing knot Collar. Such nodules for better fixation is necessary to make at least a couple, at a certain distance from each other. The remaining small end of the thread can be fixed, singe it with a match. In that case, if the work was done with light beads, the thread is better to just cut up by the roots, so as not to spoil them. 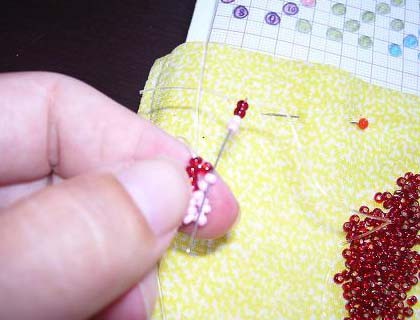 Beads should pull each other tight enough, so as not to remain areas of the thread between them and at the same time not to pull the product. Before starting work, also kindly requested to prepare the necessary materials and tools for it. Depending on, what kind of weaving technique and which product you choose, you may need: needle, thread or fishing line, crochet hooks or knitting needles, not slippery fabric as the surface for weaving and the most basic element beads. After choosing the product and tucked thereto weave scheme of beads, to start better read more about the technology of its manufacture and carefully examine the process of its implementation, if desired, may first be trained even in performing its basic elementary patterns. It is also important to prepare as soon as all the necessary elements of the product, accurately select their number. And in that case,, If you suddenly can not find the necessary color, you can experiment and to dream and to replace them with other suitable tones. Now after all the necessary preparations, you can safely proceed and create your own small masterpieces. Very original gift, and most importantly a beautiful gift can be a bracelet, woven beaded yourself. The more that play when choosing options for this product is huge, and, if desired, and good experience in beading can think and their drawings and diagrams to these decorations. For beginners only weave beaded bracelets offer to try make the following products. We put the first bead black, fasten it at the beginning of the work and leave from her distance 1 cm – a place for fasteners. then strung 27 beads in the following sequence: 2 white, 1 black, 2 white, 1 black and so on. 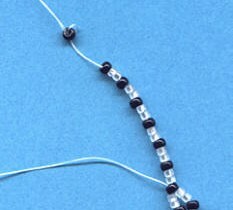 After that, the thread should be passed through the third black bead, counting from the end of, strung strips. again strung 2 white beads, 1 black and two white, and again passes a needle and thread to the second compound from the previous black bead. Bead Weaving same repeat number until the end of. Then proceed to the next row. To do this job for the convenience you need to deploy the first bead down. 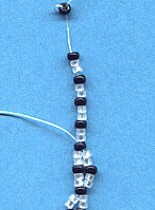 Then stringing two white beads, 1 black and two white, and threading in the first from the beginning of the black bead stringing and again the same sequence of beads and string skipping a black bead, located on the arc of the previous row (second black bead from the previous compound). 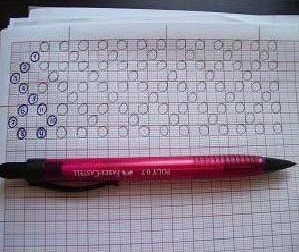 The same pattern finish line and proceed to the weaving of the following series, whose number is equal to the size of your brush. The final stage is the clasp bracelet. 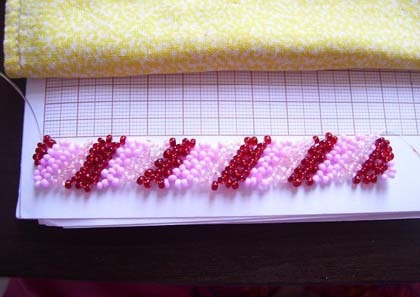 To do this, on the one hand bracelet made loops of beads chain, and on the other can be, eg, attach beads, buttons, the size of the corresponding loops. 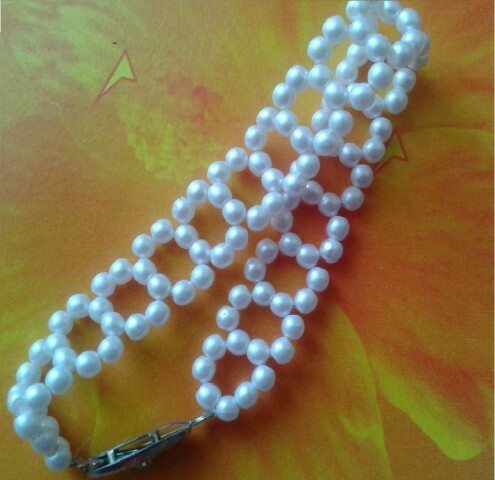 Then bracelet prepared. If desired, the bracelet can be monochrome or color change, but for a more open-work pattern instead of two white beads do, for example, three. Vdevaem on each side of the needle thread, then strung on one of them 8 beads and mix them into the middle of the strand bases. Then threaded through the second needle thread through the first bead, forming a circle. After that, the thread on the right side put on 4 biserinki, and on the left - two and threaded it through the two beads already strung on a second thread. After that, the same way continue to make a chain of circles required length. finish chain, attach it to the clasp and bracelet ready. 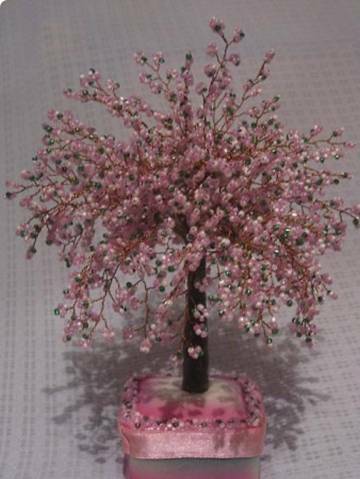 Weave trees beads allows not only fabulous and unusual, but also quite realistic. 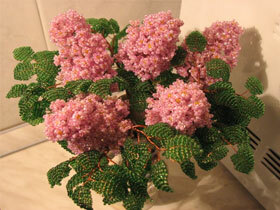 An example of this is the next job, the result of which is the stunning beauty of a tree – Sakura. cut off 70 see wires and on one of its end of the master loop, equal 20 cm. Pour the beads on the working surface. Another end of the start wire stringing them in the following order: pink, light pink, green, pink, light pink, and so on. All on the basis of the wire should be 80 beads. Then we form the first leaf. 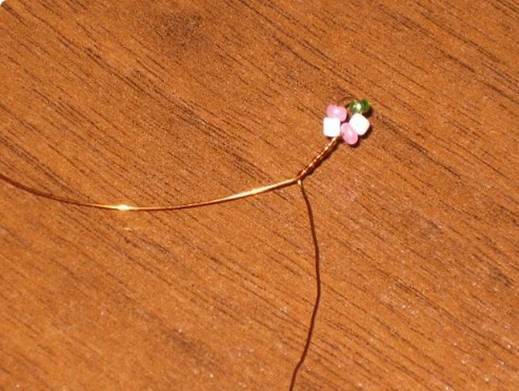 To do this, make a loop of wire with five beaded and twists it, making several turns. Then, after about half a centimeter do next leaf. Likewise forming another 14 leaves. Then leaves the wire to divide in half and bends in the middle. Then twisting two equal parts together, while trying to form a beautiful sprig. Likewise must make 60-70 twigs, or if desired, can be more. Number of branches depends on how high you want to see your sakura. In the next stage, ready to collect twigs in a bunch of 14 pcs. At the ends of the beams paste the double-sided tape or glue is applied, then swing the close of brown thread. The final stage is the twisting together in one tree all finished bundles of twigs. To a tree trunk was thicker, to the twisted ends of the branches can be attached to a thicker wire, after which the trunk is wrapped with tape as, and then turns brown thread. We attach the finished shape of the tree and place it in the prepared rack, it can be, eg, a small pot, then fill it with plaster. Stand Cushioning material, which can optionally also decorate beads. 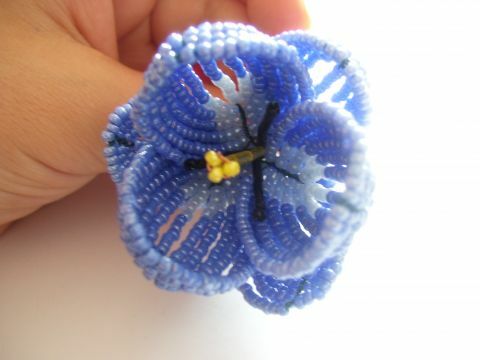 Flower Bead Weaving can be done with the help of, eg, popular techniques such as the French weaving arcs, parallel, looped or combining several methods simultaneously. Weaving beads for beginners, you can start from the following very simple to manufacture, but no less pretty colors. This little cute flower begin to make themselves with flowers. To do this, cut off 10 see the white wire and vdevaem in her first one yellow bead, and then five blue. Then we form floret, threading the wire through the first tip, second and third beads blue, and at the end through the yellow bead. 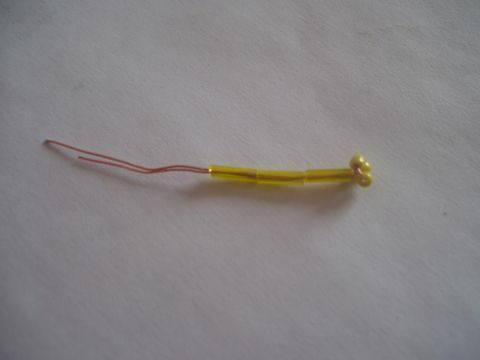 forming a flower, to bend the ends of the wire under the yellow bead and twisting them. Wire-wrap the stalk can be green thread. These flowers is enough to make half a dozen, and then joined together, twisting them together stalks. 1-2 Row. Stringing wire in the middle of green beads, then we put on each end for another bead and thread the left end to the right through a new bead, through the left and right. 3 row. Threaded on the right end of three beads, and passed through their second end. 7-a number. String on the right end of the string two beads, and the other end is passed through them. Then the two ends of the wire are braided together and attach to the leaf Myosotis. Plaiting beaded tulip need to purchase: wire, green thread for processing stalk, glass beads black and light yellow color for the stamens; Beads green leaf, black and pale yellow stamens for, as well as two shades of colors for most of the flower, eg, pink and light pink or yellow and light yellow. For the following examples use the colors blue and blue shades. on the sides to the top. Then repeat steps 6 time, until a 6 ovals. Buckle tab slightly inward, so that it took the form of boats. For the inner part we need three similar petals. Now we make the outer petals. 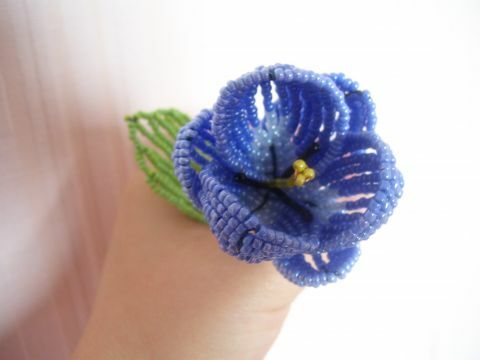 Prepare the wire as well, as well as for the interior, and stringing beads on them, but using only the blue color and quantity 12 pcs. Petal will consist of 4 ovals. In the next step of the wizard stamen. 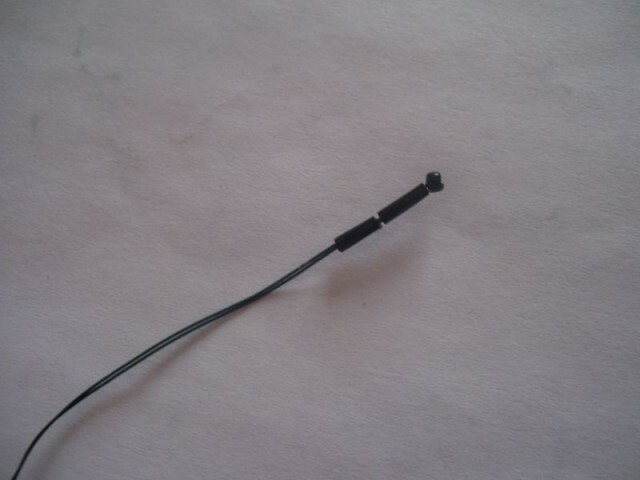 cut off 20 cm wire and put on her black bead, moving it closer to the middle,. Bend wire and passed through its two end 2 things glass beads and move them to the beads. 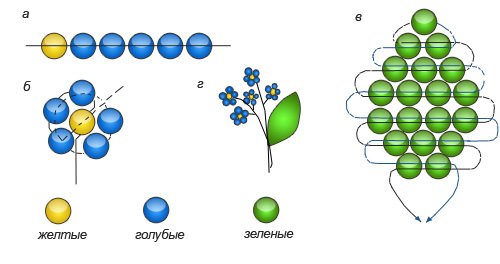 For the same business technology 3-6 stamens. You can now make and pestle. To this end we take the same length of wire, as for the stamens and strung her three light yellow beads and twist the wire at their base. After that passed through the two ends of the wire are three things bugle. last part, What is needed for a flower leaf, which makes the following. Cut the two pieces of wire, length 25 and 50 cm and twist them together. 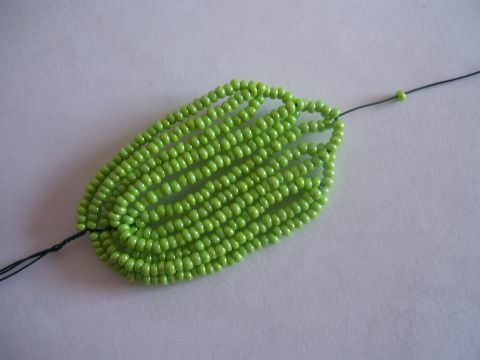 String on one end 60 beads green, then bend the wire into an oval. Then, the other put on the wire 31 bead and anchoring it in the upper part of the first oval. The third arc doing again from the first end of the wire 30 beaded and fasten it around 3-4 beads below the first fixing and then strung on the wire 30-31 beads, then fix the wire slightly below the base. In the same way we do the second half of the leaf. 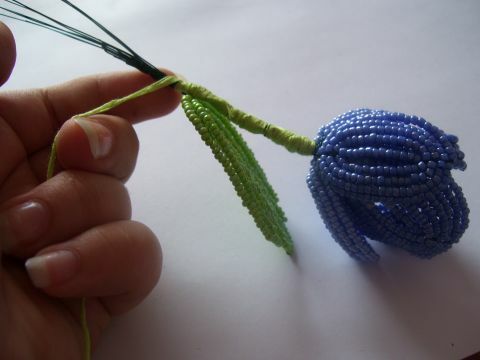 In the next stage of bead weaving flower, proceed to its assembly. First of all connect with a pestle stamens, twist them together, so that turned out to be the middle of the pistil. Then around pestle with stamens first internal anchoring leaves, and then external. The final step is attachment of the leaf and green stalk wrapping filament. roses, made of beads, even in the simplest way out simply incomparable. 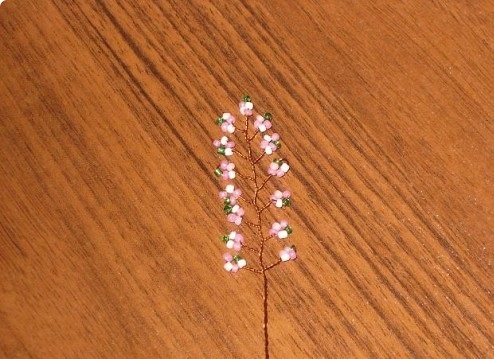 In this you can be sure, viewing the following video tutorial below, and if desired, and repeat the procedure required for weaving with beads of this flower. Openwork Baubles, with a pattern of flowers, hearts, etc..
Baubles with ornament, ie. with a variety of drawings. sophisticated Baubles, which combine several different patterns. Baubles, woven on a special machine. 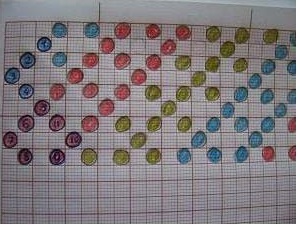 In this specification, work, instead of blue beads used red, instead of red light pink, Green was replaced with a white. Strung on a thread a needle with a first bead, move it to the end of the thread, leaving from the edge of the short distance, and anchoring a bundle tip gum. bead 11 stuff beads, focusing on the circuit. 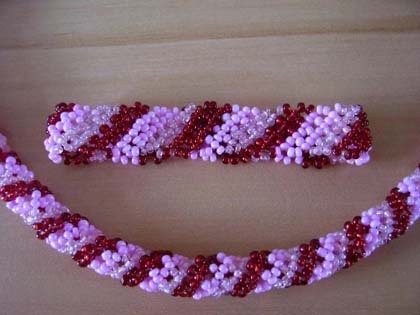 In this case, 4 reds and 7 pink beads. Then on the fifth from the start of bead threading the needle again, forming a circle. Again vdevaem beads according to the colors on the chart: 1 a red and two pink and threaded needle in the very first bead. Then vdevaem two pink, then the two red beads and skip a thread with a needle through the second bead of the three previously vdet. Then again three pink in the middle of a three-outer bead of the second circle. Again, four beads, but white in the middle extreme bead, acting circles. Bead Weaving can become a very exciting experience and Leasure, if just a little bit and go deep insight into this process. And in fact, in its development is no big deal, we just have a little practice and you will also receive the most complex products. The big plus of this craft is also something, that a huge variety of products, which are made with the help of his, can be a wonderful gift for your loved ones and friends, as well as for you.